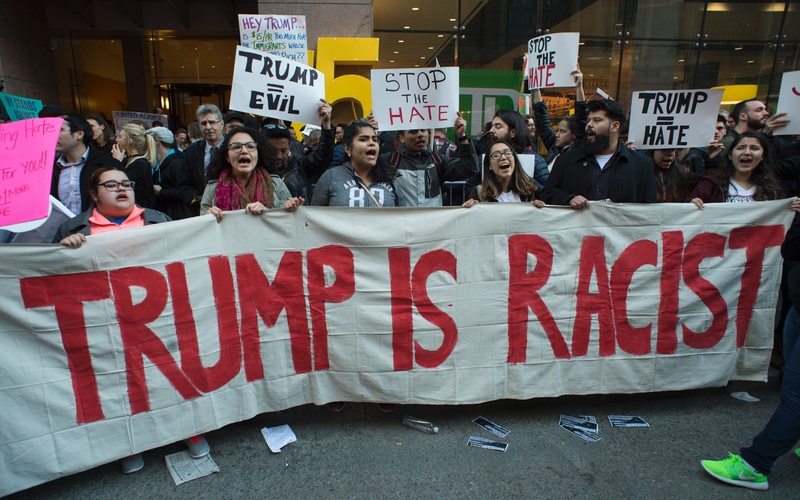 NEW YORK --Hundreds of protesters gathered outside the Grand Hyatt in Midtown Manhattan Thursday before the New York State Republican Committee's annual gala to protest GOP front-runner Donald Trump. More than two dozen people were arrested, CBS New York reported. Some of the protesters made their way inside and up to the balcony level of the hotel, chanting and holding banners, CBS News Radio station WCBS-AM reported. WCBS's Rich Lamb said the protesters suddenly burst into an elevator carrying members of the press, describing it as "guerrilla action." Lamb reported people in black ties were watching from the lobby with "looks of horror on their faces." At least nine protesters made it into the hotel, and they were all pulled out of the front door and put into a police van, CBS News Radio station WINS-AM's Carol D'Auria reported. Several others were arrested outside the hotel. Some of the demonstrators who remained outside hung an effigy of the billionaire businessman and chanted, "How do you spell racist? T-R-U-M-P."
Protests were also held Thursday over Trump's appearance at a GOP fundraiser that was held near the site of an immigrant's murder on Long Island. Activists said Trump's appearance opens old anti-immigrant wounds in light of his tough talk about building a wall on the Mexican border and other rhetoric and could undo the progress that's been made in the Long Island community. The gala to raise funds for Republican candidates across eastern Long Island was held in a nightclub about 200 yards from where an Ecuadorean immigrant, Marcelo Lucero, was murdered by a gang of teens in a 2008 hate crime attack. A sign at the site of the slaying read, "Hate is not welcome in Patchogue. Make America Love Again." When will Trump's feud with RNC end? "This is not a reality show, this is not a freaking game. These are real people, human beings with flesh and blood, and they do not deserve to be treated like animals," Rev. Allan Ramirez told CBS New York. "Donald Trump has attacked women, Muslims, Mexicans, immigrants, pretty much anyone he can," resident Dan Fingus said. "His hateful message just fans the flames of bigotry that led to the violence that led to the death of Marcelo Lucero." Joselo Lucero, the victim's brother, said the town was the wrong place for Trump to visit. "My community has suffered so much discrimination." John Jay LaValle, chairman of the Suffolk County Republican Committee, said Thursday's event was scheduled more than two months ago and he invited every Republican candidate. He said Trump, who was recently been endorsed by the county GOP, accepted only last week. "While we offer the greatest empathy possible to the family of Marcelo Lucero, we can't help but to be suspicious of the motives of those leading the charge to connect that vicious hate crime with Mr. Trump's commitment to enforcement of immigration laws that have gone largely ignored by both parties for 30 years," LaValle said.